The International Association of Professional Numismatists (I.A.P.N.) conducted the ceremony for its annual book prize award January 19 in Bangkok, Thailand. The event was held at the Imperial Queens Park Hotel with more than 100 collectors, dealers, enthusiasts and personal friends of the author in attendance. This year the I.A.P.N. honored numismatic authors Ronachai Krisadaolarn and Vasilijs Mihailovs for their ground breaking work on Thailand, “Siamese Coins from Funan to the Fifth Reign”. Their reference has quickly become the standard in the field of Thai coinage. 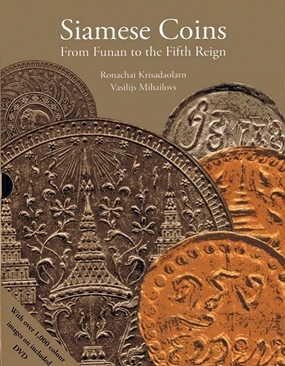 Thai coinage comes under the spotlight in the book “Siamese Coins from Funan to the Fifth Reign”. The book is not only exceptionally well written and researched, but was also much needed in this field. Prior to this publication very little had been written about Thai coinage. That which is already in the public domain is often hard to acquire, or is scattered through various publications and journals. Also of note, the last major reference solely on the subject was written some 80 years ago by Reginald Le May. This new work by Krisadaolarn and Mihailovs takes Thai coinage to another level of academia. The basis of their work began with lectures given by Ronachai Krisadaolarn at the National Museum of Thailand in Bangkok in the 1980’s and 1990’s. An extensive amount of time and research was put forth by the authors to make this project possible. They record historical data as well as scientific analysis of the coins, including analyzing the metal with X-ray Fluorescence and Inductively Coupled Plasma Mass Spectroscopy tests. The reference also discusses the diagnostic features of genuine coins along with those of known counterfeits as well as how to detect the latter. The acknowledgements cite many major collections, museums and institutions for allowing their collections to be viewed and catalogued. These include the Bank of Thailand Museum, The National Museum of Thailand and The Royal Thai Mint Museum to name just a few. The hard cover book is 271 pages, with color images, including graphs and charts discussing the emblems and iconography of Thai coinage. This reference is a definite “must have” for any serious numismatic library. Since 1982 the I.A.P.N has annually conducted its book prize award honoring numismatic authors for what the organization considers “the best numismatic publication of the year”. Each year books are submitted to the I.A.P.N. and voted on at their annual congress. First place consists of a medal, a diploma, and a monetary reward. For more information regarding the I.A.P.N. please visit their website: www.iapn-coins.org. I.A.P.N. 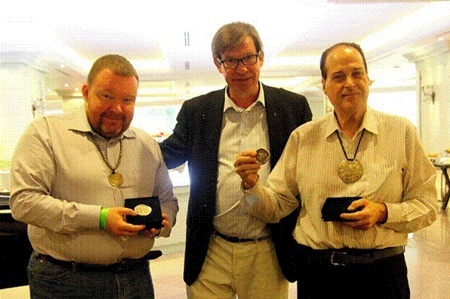 member Vasilijs Mihailovs (left) and Ronachai Krisadaolarn (right) stand with Thai coinage expert Jan Olav Aamlid (center) at the award ceremony in Bangkok. Mihailovs and Krisadaolarn are displaying their I.A.P.N. 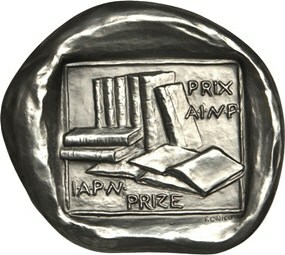 book prize medals.